Roses unfairly have a reputation for being fussy. It all depends on what you plant. Here are the lowest-maintenance roses for Iowa, by either name or type. Click here for a printable pdf version of this web page. I love, love, love roses. They're beautiful and some are fragrant and if you choose the easy kinds, roses take no more time or effort than, say, perennials. Below are some of the roses I feel are the best for Iowa and take very little fussing. With the exception of rugosa roses, the only winter protection these need is mounding a few spadesful of soil or compost over the base each winter. They are also very disease- and pest-resistant with minimal black spot even in late summer. None are fragrant (a tradeoff with most super-tough roses) unless noted. This is a large gorgeous rose with tiny pink flowers that bloom from June until frost. 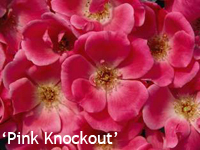 It's so tough and reliable that it's been crossed with many other roses to develop new types. In fact, it's so showy your neighbors will all ask what it is. 3 to 5 feet high and wide. 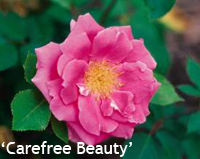 'Carefree Beauty' is the most famous Buck rose, bred by ISU professor Griffith Buck. Just about any Buck rose will do well in Iowa with little care (ISU didn't give him much money for staff or supplies, so he had to make do!). Buck roses usually have fun Iowa-related names to boot. 'Distant Drums' is one of the most prized for it's gorgeous, subtle coloration. You can mail-order Carefree Beauty from Thistledown Nurseries of Lake View, Iowa, by calling 712-661-9734. Des Moines Seed and Nursery/Herndon's in Des Moines carries several of the other Buck roses. This is the closest you'll find to a plant-it-and-forget-it rose, mainly because it needs little winter protection, is very pest- and disease-resistant, and it needs very little pruning. The only maintenance, really, is to trim off the dead stuff each spring and mound it in the fall. About 3 foot by 3 foot. Heirloom Gardens in Van Meter outside of Des Moines carries several types of Knock Out roses, including the hard-to-find yellow type. Flowers are bright pink, aren't a size or shape that's anything special and bloom just once each year, but they're gorgeously prolific. Great for a large arbor or pergola. Canes get maybe 12 feet tall and are very stiff with large thorns. 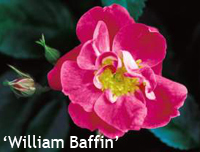 William Baffin is the name of a Canadian explorer and the rose is one of a series, bred in Canada, called the Canadian Explorer series. All are good choices for Iowa because our climate is not unlike that of Saskatchewan, for pity's sake! Other popular cold-hardy Canadian Explorer series include 'Henry Hudson', 'John Cabot', and 'Henry Kelsey'. Size varies widely among each. The name says it all. They're rugged. They actually dislike spraying and pruning—they flower best without it. And rugosa rosescan take or leave fertilizing, though they do a bit better with it. 3-6 feet high and wide, depending on the type. Some are very fragrant and others not at all. Pink 'Terese Bugnet' is my favorite rugosa--beautifully scented! 'Hansa' is an excellent type. ‘Topaz Jewel’ is one of the few yellow rugosa—a sunny yellow. I love the deep, rich red of 'Linda Campbell'. These Minnesota-developed roses are new on the rose scene. The Easy Elegance collection of roses are super-cold hardy and like so many tough roses, are usually fragrant and have soft, subtle colors. About 2-3 feet high and wide. I especially love 'Kiss Me because of its gorgeous peach and pink colors and great fragrance. Click here to find a retailer that carries Easy Elegance roses. It's hard not to be charmed by this little polyantha rose. 'The Fairy' grows maybe 3 feet by 3 feet with an open, somewhat spreading habit, but the charmer is the little clusters of baby pink "sweetheart" type roses. Long, long bloom time. About 2-3 feet high and wide with a tendency to grow wider than it does high. These are technically part of the Parkland series of roses, but they usually include 'Morden' in the name, the spot in Canada where they were developed. 'Morden Blush' is one of the best. Most grow 4-5 feet high. I hestitate to put David Austin roses in this listing because they're not as bullet-proof as the rest. But I decided to because most of the really tough roses are well, a little common. They're not very exceptional in terms of large, complex, beautifully colored flowers. David Austin roses look exquisite and smell fabulous. David Austin roses are a little less cold-hardy than those listed above but still do very well in Iowa. Also, they're pretty disease-resistant, though they do get quite a bit of black spot in late summer. 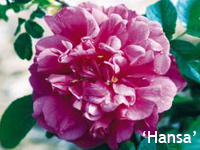 Created by British breeder David Austin, these are big, old-fashioned looking roses (think cabbage roses). Also called English roses, they are blowsy, fragrant, and wonderful. Prettily pink 'Mary Rose' has been growing in my garden for 20 years. 'Graham Thomas' is one of the few yellow roses that grow easily in Iowa. 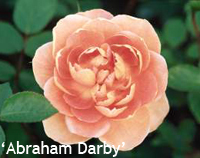 And apricot-colored 'Abraham Darby is the favorite all-time rose of many a gardener. It's so beautiful it looks like it would even taste good!